Welcome to another Artisan Design Team Blog Hop. On this hop, we are focusing on the Petal Promenade Suite on pages 106-107 in the 2018-2019 Annual Catalog. If you are hopping, you should have just arrived from visiting Charlet Mallett. I love every single one of her projects and those flowers...are wonderful! As a matter of fact, I have seen most of the projects on today's hop, and you don't want to miss a single one. This entire suite is so romantic. There are many things to love about these products. I especially like the Beautiful Promenade stamp set (#146842) because it is so versatile. For my card I stamped three large flower and matching inside layer in Fresh Fig, Melon Mambo, and Pumpkin Pie ink. For the flower centers I added small dots of White Craft Ink and then heat embossed them with White Embossing Powder. I stamped the leaves with Old Olive ink and then used Old Olive Stampin' Blends to add color. Classic Ink is water-based and the Stampin' Blends are alcohol-based, so they work well together. I used the coordinating Beautiful Layers Thinlits Dies (#147043) to die cut the stamped images and I also die cut a few additional leaves from Mossy Meadow cardstock. The sentiment is also stamped in Fresh Fig ink. For the background, I embossed a piece of Whisper White cardstock with the Tuffed 3D Dynamic Embossing Folder (#146335). Next, I mounted the panel on a top-folding card base and arranged the flowers and leaves in the top center of the card. After I adhered the stamped images, I added even more interest with various sizes of pearls. I have a little bonus project to share today as well. I pulled together this sweet, little pillow box using the stamps and dies from the same set. I started with a Kraft Pillow Box (#147018) and applied Mossy Meadow ink with a sponge dauber. The white polka dots resists most of the ink and it gives you endless color possibilities. Just remember, the box is kraft, therefore not all colors (especially lighter ones) will show up true to their original shade. I wanted to achieve a chalkboard effect, so I stamped the sentiment and frame with VersaMark ink and heat embossed with White Embossing Powder. I also used a Whisper White watercolor pencil to lightly shade in the corners to add to the effect. Finally, I stamped and die cut several of the flowers/leaves to create a sweet bouquet. I also had to do a little bit of additional trimming on some of the flowers. I have to confess that I don't remember what colors I used for the flowers. I think it was either Highland Heather and Grapefruit Grove with Mossy Meadow leaves. Welcome to special Artisan Design Team Blog Hop. On this hop, we are featuring the Dashing Along Host Promotion featuring exclusive Designer Series Paper available only for a limited time. The Dashing Along Designer Series Paper is a collection of beautiful, traditional Christmas paper featuring a mix of old favorites and new patterns. This assortment has an eclectic feel and is perfect for layering. I really wanted to give you a feel for how pretty this paper is, so I used one of each design to create some beautiful tags and simple sleeves that can hold gift cards, money, or lots of other fun things. This DSP coordinates with the Dashing Deer Bundle (#149935) from page 9 of the new 2018 Holiday Catalog. With a color pallet of Cherry Cobbler, Garden Green, and Whisper White, this paper will look great with all of your holiday projects. This offering includes 12 sheets of 12"x12" DSP: 3 double-sided sheets (6 total designs) with 4 sheets of each design. It is also the perfect weight to makes the beautiful rosettes featured on two of the tags. To make the tags, I used the Scalloped Tag Topper Punch (#133324). Then I used a variety of images that were either stamped and/or die cut with the Dashing Deer Stamp Set and Detailed Deer Thinlits Dies. I also added a few additional accessories like foil and glimmer papers and Garden Green Baker's Twine (#147814). Finally, I sponged Soft Suede ink around all the edges to give a vintage look to the projects and some of the tags even have clear rhinestones to add more sparkle. Elizabeth Price is next on our blog hop so be sure to head on over and check out what she and the the rest of the Artisan Design Team team have in store by clicking on the button below. We have another great sketch challenge this week at Global Design Project. You have to know that it would be completely out of character for me to follow a sketch exactly, but this week I came a little closer than normal. I did, however change it up from a horizontal layout to a vertical one. It was the only way I could get the flowers to fit on the card and stay balanced. One of my favorite suites in the new 2018 Catalog is the Country Lane Suite (pages 42-43). I love everything about it. I decided to incorporate several products from this suite into this challenge card. The trickiest thing about this card is the cut out around the floral images. I used a pencil to determine where I wanted to cut before I actually did the trimming. Thank you for joining us for our monthly Fancy Friday Blog Hop. The Fancy Friday team consists of some of the most talented Stampin' Up! demonstrators around...all past or current Artisans. If you are hopping with us, you should have just arrived from visiting my very good friend, Cindy Schuster. It feels like old times. Did you know that I used to follow Cindy on our 2016 Artisan Design Team blog hop every month? Now she works as a Concept Artist at Stampin' Up! How exciting! This month our challenge was to pick a bundle from the 2018-2019 Annual Catalog. 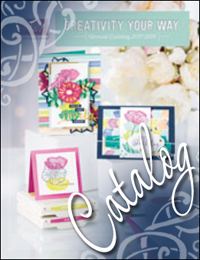 With so many amazing product bundles in the annual catalog, it is difficult to choose where to start. I happened to have the Beautiful Promenade (#148389) bundle on my desk, so that is what I used for this hop. Even though I have seen this set used in so many beautiful ways, I am always looking for a way to do something unique or unexpected. This set has a lovely, large flower outline, but I decided to focus on creating an abstract look by using the "fill" portion of the flower instead. I love how it brings out the lines of the smaller flowers without overpowering the sentiment block. I opted to stay with a more classic and vibrant color pallet of Melon Mambo, Pumpkin Pie, Rich Razzleberry, and Old Olive. I absolutely love the sentiment in this set and the typography is amazing. I can't wait to see what the other Fancy Friday team members have created. Be sure to hop on over to visit my amazing friend, Jenn Picard. Jenn and I both won the Artisan Award in 2011 and we have been super good friends ever since. I know you are going to love her project this month. I love a good color combo and this week's color challenge at the Global Design Project really brought out the best in our design team. I know you have heard me say this time and time again, but I don't really think I would have picked these colors. I tend to be a creature of habit when it comes to color and stick with my favorites. But nothing ventured, nothing gained...right! In the end, I just adore how this turned out. With Autumn right around the corner, this card is perfect for this time of year. Obviously, I relied heavily on the Soft Suede in this combo. I saved the Flirty Flamingo and Daffodil Delight to use as accent colors. It is pretty amazing how well these two lighter colors still manage to come through on the darker cardstock. Of course, they are much more subdued when sponged over Soft Suede. I cannot tell you how much I love the Rooted in Nature (#146482) stamp set and coordinating Nature's Roots Framelits Dies (#146341). The gold embossing on the sentiment and smaller leaf clusters is difficult to see, but they add a lot of elegance to the finished card. I used Very Vanilla cardstock to really make the sentiment stand out on the dark background. I also used framelit dies from the Foliage Frames (#146353), Stitched Labels (#146828) and Stitched Shapes (#145372) sets. I colored some Clear Rhinestones with Stampin' Blends markers (Daffodil Delight and Calypso Coral) to add just another hint of soft color. This card has a lot of layers to begin with, so I decided to really play up the natural feel of the foliage by using a bone folder to give the leaves some additional interest. In the end, my quick "15-minute" card ended up taking up a good portion of the afternoon, but it was totally worth it and I found a way to use this color combo in a way that totally fits my design style. Welcome to another Artisan Design Team Blog Hop. On this hop, we are focusing on the Stitched All Around Bundle (#148373/#148374) on page 17 the 2018-2019 Annual Catalog. I focused on the beautiful sentiment in this stamp set and then pulled in the detailed dies that comes in the bundle. Look how amazing the frame is when used with the embossing mat. I just love those adorable little stitched hearts...aren't they just precious! The colors on this card are Poppy Parade, So Saffron, and Bermuda Bay. ... with some Silver Metallic Thread for an accent (#138402). I have a second card for you today! It has the same colors, but has a totally different look when used on Smokey Slate cardstock. I used the Subtle Embossing Folder (#143706) to add some texture to the background and the 5/8" Polka Dot Tulle Ribbon (#146912) adds just a touch of softness. I just amazes me how this color combo just pops off the page. Be sure to add this fabulous bundle to your next order.